While posting on Birdforum http://www.birdforum.net/showthread.php?t=129001 this response from Laurent (l_raty) jumped out as being the best clue to ID for our own Saunder's Little Tern complex - I have pasted it here as I think it too important to loose. I'm not familiar with Saunders's at all, so won't attempt an identification. But I would not expect this type of character to remain valid throughout the year. Contrasts in a tern's hand are typically moult contrasts - the paler grey feathers are fresher, the darker black/blackish feathers are older. The moult of Little Tern is rather complicated - but I think you just can't understand the contrasts you will see in the birds' wings without a basic understanding of what is going on in these wings. The primary moult happens sequentially, in 'series' that start with the innermost primary and run towards the outermost. But these birds, unlike many others, do not 'just' replace all of their primaries once. When a series reaches the mid-/outer hand, a new series is normally started in the inner hand. And so on, in a process that stops only at the approach of the breeding season. Usually three such series are started between two breeding seasons. The first starts with the innermost primaries in (late) summer; this series runs through the entire hand, and gets completed with the outermost primaries being replaced around Dec-Jan. Before this (Oct-Dec), a second series starts in the inner hand. When this second series reaches the mid-hand (Feb-Mar), a third series starts again in the inner hand. These second and third series do not get completed, though, (i.e., they never reach the outermost primaries) because the moult process is arrested completely just before breeding. During breeding, the birds have primaries that have been renewed through the first, second and third moult series of the previous non-breeding season. The outermost 1-3 feathers have been renewed only once during the previous winter (first series, the only one that reaches completion), and date back from Dec-Jan. The median primaries have been renewed twice (first, then second series); the inner primaries have been renewed thrice (first, then second, then third series); these all date back from late winter/early spring. At this point, the outermost 1-3 primaries are several months older than the rest of the wing and are going to look very much darker. During summer and autumn, though, the feathers that were fresh and pale in spring are progressively going to turn dark as they get older, and the contrast that was so obvious in spring will fade out little by little. Then, the first moult series will start and pale new feathers will be regrown in the inner hand. This means that on a late autumn Little, you could perfectly see 4 dark outer primaries contrasting against a paler inner hand. On a mid-winter bird that just completed its first moult series entirely, whatever the species, the outermost primaries will be fresh, thus grey, and you'll see nearly no contrast at all. Adrian and I were out birding here in Bahrain a few weeks ago with two visiting birders in tow on the Jebel Dakhan. Adrian photographed a Desert Lark, that I had pointed out. Yesterday he put the picture up on his photo pages and since I have received several emails to tell me that my ID is wrong and in fact the bird shown is a female Black Lark Melanocorypha yeltoniensis. 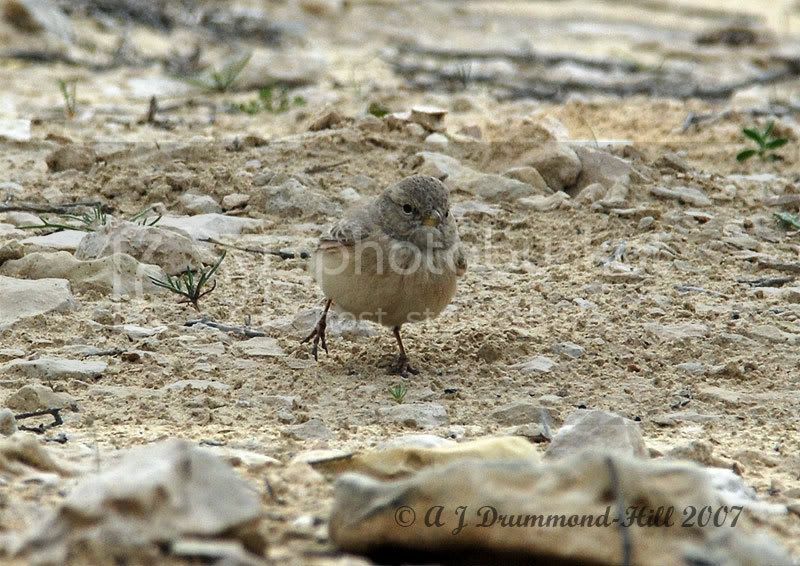 The first two pictures are the two images as taken by Adrian - below are two further Pictures I took today of a Desert Lark on the Jebel. I am sticking to my original opinion Desert Lark - Comments please!